LONDON — Advertisers are expected to spend a combined $30bn on online video advertising this year, most of which will be paid to social media platforms despite the continuing risks of negative adjacency and ad fraud. The rise of mobile usage is driving video consumption (particularly on mobile-optimised social platforms), which in turn is driving up advertiser investment in video. 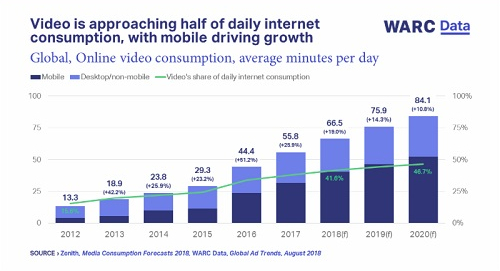 These and other key findings are included in the latest monthly Global Ad Trends report focusing on online video advertising compiled by WARC, the international authority on advertising and media effectiveness. Online to account for 17.5% of global video spend this year, at $30bn – most will go to social platforms. Online video advertising expenditure – inclusive of pre/mid/post roll, social and broadcaster VoD – is expected to rise 27.5% to reach $29.8bn this year. This compares to an anticipated rise of 1.1% for linear TV, which equates to $140.2bn – on a par with the level recorded in 2010. Consequently, online video is set to account for 17.5% of the total $170bn spent on video advertising worldwide this year, up from a share of just 1.3% in 2010. Rates vary between markets. Online’s share in the US, the largest video market by far, is expected to rise to 19.3% this year, at $15.3bn. China’s online share is projected to rise to 24.7% ($6.5bn) this year, while in the UK online video is expected to account for 38.2% ($2.6bn) of all video adspend. Most of this money is going to social platforms such as YouTube and Facebook. UK data from the AA/WARC Expenditure Report show that of the GBP1.6bn spent on online video advertising last year, 81.2% (GBP1.3bn) was paid to social platforms (up from a share of 55.4% in 2014). Online video consumption – the majority of which is via mobile devices – is rising steadily worldwide. Projections show consumption will rise to 84.1 minutes per day in 2020, up 26.6% from a projected 66.5 minutes this year. Of this, 62.3% of the time will be spent watching via mobile devices (compared to 60.7% currently). Comparing these figures to wider media consumption data shows that online video’s share of daily consumption is rising across the board. It is expected to reach almost half (46.7%) of all internet usage and 17.1% of total daily media consumption by 2020. Data for the second half of 2017 show that at least one in ten online video ads poses a risk of negative adjacency to brands. For mobile, the content types that pose the most frequent brand risk are violence, and offensive language & controversial news regardless of whether the ad is bought programmatically or publisher direct. Fraud also poses a risk to online video advertising, especially if the ad is not optimised against such activity. A recent study by Guardian US and Google found that as much as 78% of video spend is susceptible to fraud if the publisher does not employ the ads.txt script within their website. Summing up, James McDonald, Data Editor, WARC, says: “The vast and continuing increase in video consumption via mobile devices has directed ad dollars to social platforms, despite the well documented and persistent risks around negative adjacency and ad fraud.